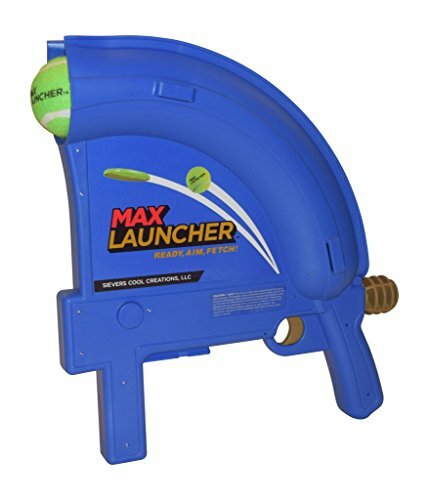 If you’re looking for a long-throwing ball launcher, the Max Launcher is the best handheld dog ball thrower in the market. It’s also the priciest. When it comes to dog ball throwers, there’s a ton of options out there for both automatic and handheld varieties. Out of all the different models we have tested, the Max Launcher lives up to its name by launching a tennis ball longer than any other! 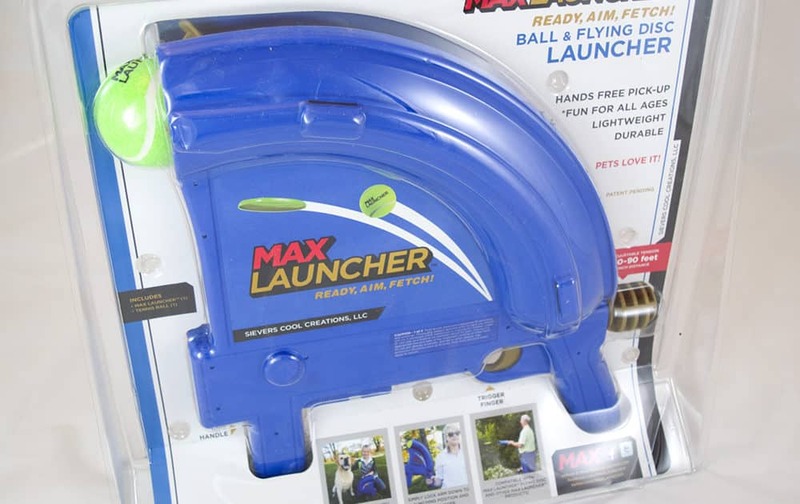 The Max Launcher is very unique in both its features and design, so keep reading our Max Launcher review to learn more about how it performed in our hands-on testing and if it’s the right dog ball thrower for you! The Max Launcher comes in really nice packaging, some of the best we’ve seen for handheld dog ball throwers. 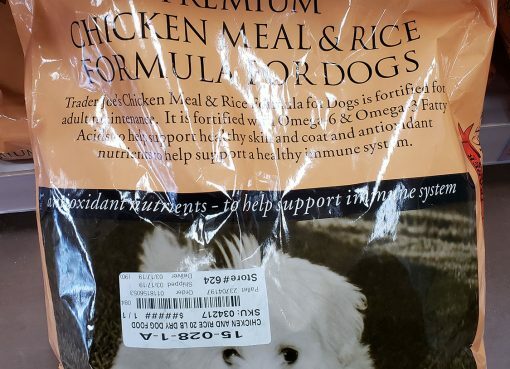 There’s no annoying zip-ties to cut and the packaging does a great job of giving you an overview of the features in an easy to understand manner. After removing the ball thrower from the plastic, you’re all set to throw! The Max Launcher has an interesting and unique design in which you hold it with two-hands, almost like a firearm. A standard-size tennis ball (one included, see a comparison to a regular tennis ball below) is placed into the throwing arm, pulled fully back, and then the trigger is pulled to launch. This device can also launch a Max Launcher Flying Disc (sold separately), in which case you pull the firing arm back, place the disc in, and fire while holding the launcher sideways, so the disc flies out parallel to the ground. When it comes to durability, the Max Launcher did nicely in our testing, for the most part. While the tennis ball held up to lots of play, our dogs preferred to chew and destroy the rubber flying disc which didn’t take long! 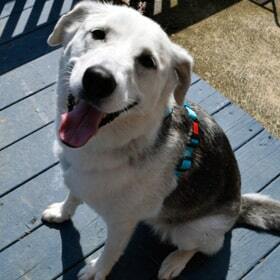 We suggest if you get the flying disc, don’t let your dog play with it unattended. In order to launch the ball, once loaded, you pull back on the throwing arm all the wayback to get it primed into the “ready to fire” position. If you only pull the arm partway back, the trigger will not activate the throw. In our experience, the act of pulling back the arm is the toughest part of using the Max Launcher. It uses such a strong spring that it becomes a little unwieldy to hold the device with one hand and pull back the arm with the other. We wouldn’t suggest a child use this on their own, as it would be very easy to get a small finger caught in this device. On the back of the device, you’ll find an olive-colored knob which you can turn to adjust the launching power. Turning it clockwise will make it throw farther, and counter-clockwise will lessen the distance. The Max Launcher comes with a green tennis ball which is the same size as a standard tennis ball. This can be launched from 40-90 feet. You can also purchase a flying disc which floats much more in the air, and can be launched 90-120 feet. You can pick up a ball off the ground by pressing the arm of the Launcher directly into the ball. 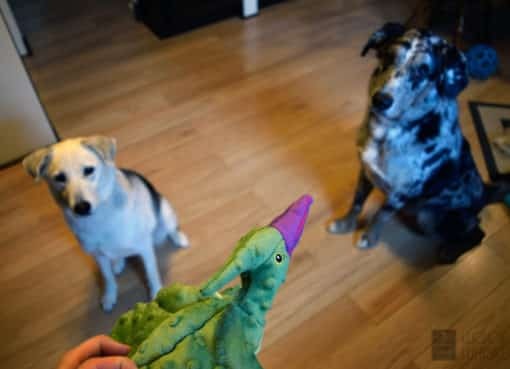 In theory, this would make things easier and you wouldn’t have to touch a slobbery ball, but when you’re pulling back the arm you’ll likely be touch the ball anyways. In our hands-on testing, we found that the advertised distances of 40-90 feet for a tennis ball and 90-120 feet for the disc to be accurate, making this the farthest launching thrower out of our tested dog toys! We were also impressed by the reliability of the distances this launcher was able to achieve. Who is the Max Launcher Best For? The Max Launcher is an ideal dog toy for the pet owner looking for maximum throwing distance with an easy-to-launch device. 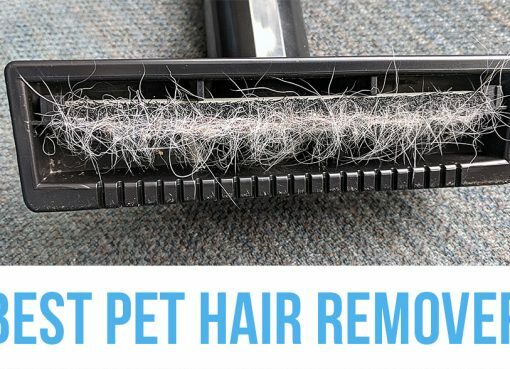 Due to the power of this toy, we wouldn’t recommend it for indoor play. 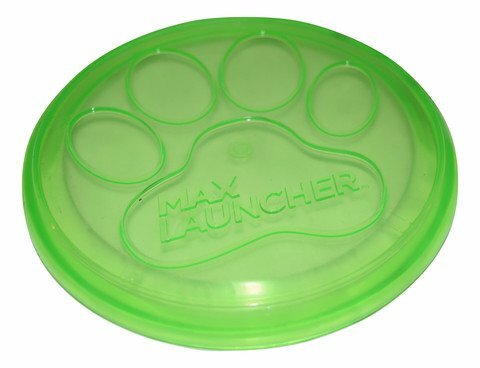 If the versatility of chasing balls or discs is something your pooch would love, then the Max Launcher is a great fit as well. This shouldn’t be a toy for young kids to use, as it will be too difficult for them to safely pull back the throwing arm. We would recommend the something like the Nerf Dog Blaster if you’re looking for something that the whole family can enjoy – see our Nerf Dog Tennis Ball Blaster review. We hoped you liked our honest Max Launcher review! Leave a comment below with any questions you might have.